Members of Family Reach, Tufts Medical Center and Golf Fights Cancer. Golf Fights Cancer (GFC) is a nonprofit, volunteer organization based out of Norton, Massachusetts. GFC taps into the passion and generosity of all golfers to raise much-needed funds for cancer-related organizations and families living with the diagnosis. Recognizing the tremendous fundraising potential in the golf community at-large, Jay Monahan, Brian Oates and a few of their friends created GFC to fight cancer and make financial contributions that have an immediate and tangible effect. The organization has raised over $6 million dollars since 2003 to help improve the lives of patients and their families. On June 19, Golf Fights Cancer held their Ninth Annual Golf Marathon. It was an unbelievable day of camaraderie, golf and great memories. At this year’s event, 25 golfers of all skill levels played 100 holes in one day, raising $128,000! 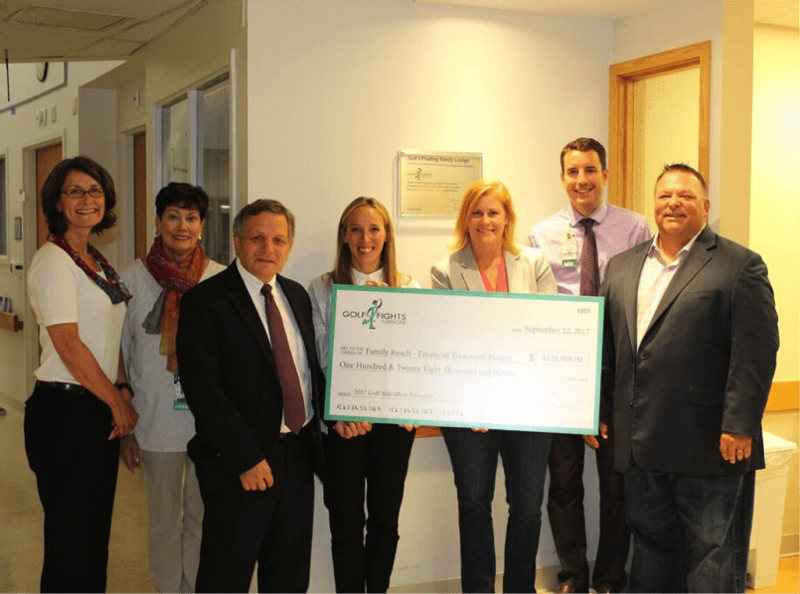 In partnership with Family Reach, the funds raised will go towards the Financial Treatment Initiative, a pilot program at Tufts Medical Center. Insurance Navigation – Patients and caregivers will learn how to work with their insurance provider to lower out-of- pocket costs for cancer treatment. Resource Navigation – Patients and caregivers will enroll in third-party programs that will pay for out-of-pocket medical costs (e.g. copayments, premiums) and non-medical expenses (e.g. housing, travel, food). A pro bono Certified Financial Planner will meet one-on-one with patients and caregivers to help them manage their family’s financial health throughout treatment. A Financial Handbook, created using the knowledge of former patients and caregivers, will provide families with the information they need to prepare for potential financial roadblocks. Patients and caregivers will receive financial support for everyday living expenses – housing, transportation, utilities, food and more. Cancer-related financial toxicity is a national crisis hiding in plain sight. Families fighting cancer across the country are overwhelmed by lost income and increased out-of-pocket costs associated with treatment. As the bills pile up, they face higher mortality rates, the inability to adhere to their treatment plans and bankruptcy. The goal of the Financial Treatment Initiative is to change this current landscape through innovation and collaboration. It will provide families fighting cancer with the financial tools they need to manage their financial health and adhere to treatment. Empowering patients and caregivers with these critical resources, we’re increasing their chances of survival.